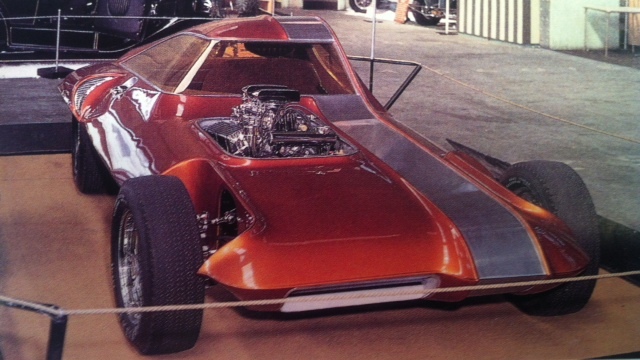 In 1965-1966 Dave Puhl of Puhl’s House of Kustoms created a “driveable” New Trend in Muscle Cars for the then ever popular show car circuit to showcase ideas such as things we currently see at SEMA these days. 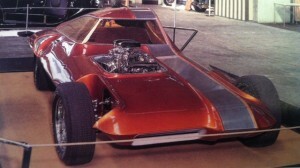 The “ILLUSION” was built as an asymmetrical design and constructed similar to the front engined Indy Cars of the day with a tubular space frame and hand formed sheet metal for the way out body contours. I was just in late grade school at the time but got to hang around the shop as my Dad was partners with Dave and was his shop foreman and painter for many of the customs that were turned out by House of Kustoms for a few years. 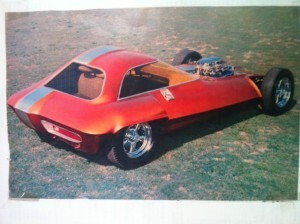 I also helped with building the “concept wooden model” of the Illusion that was shown in some of the magazines back in the day prior to the real Illusion’s first public showing at 1966 Winter Autorama in Los Angeles and at the Oakland Roadster Show. The car was a “bottom breather” with intake scoop and radiator beneath the front end. Suspension was from a Morris Minor for the front with Torsion Bar adjusters with a Corvette rear end for fully independent set-up. Brakes were also from a Chevrolet Corvette. Muscle power was provided by a then fairly new Hi-Po FORD 289 with Dual Quad Carbs. The Brushed Aluminium divider was off set to the right side to follow the “asymmetrical” design theme instead of being a painted stripe,which was pretty common on Race and Customs of the time. The paint was a beautiful mixture of candy copper and orange over a gold base. It won many awards and if I remember correctly was in a movie or two with bit parts. With the “trend” of bringing back older “Show Cars” and restoring, Pop and I had always thought it would be great to find it and bring the ILLUSION back to life. The car seemed to be lost for a long time like many of the old customs and race cars. However just recently in a new book I saw on Custom Cars it appears the Mid-Western Customizer and Show Promoter Karl Casper had found and acquired the “ILLUSION” and was set to restore it in the near future. We will look forward to maybe seeing it again some time soon on display at some museum or even at the Grand National Roadster Show. In 2000 or 2001 here in Reno for Hot August Nights, we talked to George Barris, who happened to be here with one of his restored customs,I think the Ala-Kart, and we asked him about the ILLUSION and had he heard where it might be located. He loved the car from seeing it “back in the day” but did not know what had happened to it at that time,however he told us he did have the model he thought for some reason. He thought it was up in a storeroom in his Hollywood area shop with a bunch of other old things just laying around and we could come get it if we wanted. Never did get back down that way to check. I wonder if he still does have it as it would be a nice “collectible” to have after all these years. Mr Barris, if you see this, maybe I will finally plan a trip to come check out that storeroom.